Business readers will invest to get specialized information that gives them the edge against a competitor. But how do publishers who sell subscription-based newsletters, magazines, reference manuals and training programs get those business readers to invest in their publications? The usual methods of direct mail and online ad campaigns figure into their marketing strategy. But the publication itself is also a powerful tool to reel in buyers, and specialized information publishers often use part of their own content to generate future sales. I asked top publishers to share the methods they use to sign up new subscribers. You will learn their tactics, many of which can be adapted for other types of subscription-based businesses. Back-to-basics marketing is a strategy many subscription publishers still use. Guy Cecala, CEO and publisher for Inside Mortgage Finance Publications says direct mail, and even old-fashioned word-of-mouth, remain part of his marketing strategy. “We get a lot of traffic simply from people who hear about us or learn about us. And, we get orders that way,” he says. “Investing Daily” is another company that uses direct marketing. The publication provides actionable stock market advice, as well as free investment newsletters. It generates its new customers with hard offers which are advertised through online platforms, like Google AdWords and Outbrain, according to president Phil Ash. The company also rents email lists, or swaps lists with competitors. Selling a subscription isn’t a matter of simply designing the right ad and launching it on the right platform. In the highly competitive world of financial publishing, it’s not enough to just generate a lead, says Ash. “The key to our marketing campaign is its sales funnel,” he says. The company puts multiple upsells and one down-sell in place. It allows the company to suggest a higher-priced product than the one the customer was originally shopping for; or, a lower-priced product, in case the customer is sticker-shocked by the company’s standard fare. “You can’t just go at it with your front-end offer. You won’t get the ROI,” states Ash. When a publication is highly specialized, a sales bundle is one strategy that can lure readers to try it out in a relaxed way. Columbia Books and Information Services sells specialized information and data to professionals involved in grants, associations, politics and industries that are closely regulated by the federal government. The company’s favorite way to win subscribers is to bundle useful reference subscriptions with training, says company president Joel Poznansky. “We actually build familiarity with our powerful compliance reference subscriptions into the training experience,” he adds. Once a customer tries a publication and it helps their business, they’ll subscribe in order to keep getting it. That’s why trial subscriptions are so effective in the publishing world. SalesTrainingWorld.com provides top-quality training and coaching for sales managers and other sales professionals. Its founder, Ryan Dohrn, swears by free webinars. He uses Gotowebinar and then promotes the topic heavily. Free podcasts are another tool Dohrn uses to introduce prospects to his training. Both webinar and podcast production take a bit of training and technical expertise to make them affordable, he cautions. Also, to gather a strong following, the content must be essential to some aspect of the listener’s business or personal life. Cecala uses a free trial newsletter to sell subscriptions to “Inside Mortgage Finance.” The publication includes statistics and B2B news for residential mortgage executives. The company sends out samples of its print newsletter over several weeks. If consumers like the samples, they’re invited to convert to a subscription. “Our flagship newsletter is basically $2,000, so it’s not an impulse buy for many people,” Cecala says. The free sample generates subscribers, not only for the full newsletter, but for a higher-priced product—data subscriptions. Inside Mortgage Finance sells the data in its newsletters, without the editorial content, as a premium product. It’s the fastest growing segment of the company’s business. The way subscription publishers generate leads—with direct print and online advertising—is standard marketing fare. The way those leads are converted into subscribers is not. Publishers often walk consumers through several intermediary steps in order to woo them into a paid subscription. 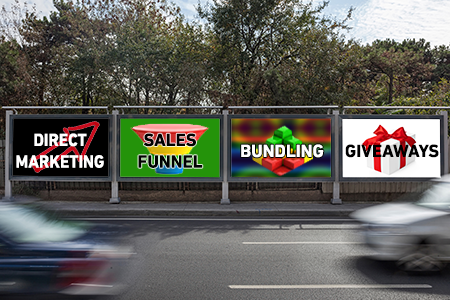 A sales funnel lures a buyer with more than one product and price option. A bundle tempts the buyer to try a product he may not readily understand. And, free samples can set a consumer on a path to escalating purchases. When publishers lay the groundwork for a relationship to take hold, the subscriber becomes a loyal partner.